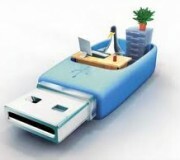 Browsing articles tagged with "fbinst Archives - AgniPulse"
There are many ways and tools to hide or protect important data on a USB Flash Drive.However a simple format of the USB Flash Drive can erase the important data. Using Fbinst, a hidden partition can be created to store important data.This hidden partition stays even after formatting the USB Flash Drive. Fbinst is a really good USB Flash Disk formatting tool.However there are no deb or rpm packages for Fbinst.So you have to compile it from the source to use it in Linux.